Thanksgiving can be a busy day for a Seattle plumber. Household plumbing that may already need service can get pushed to the limits over the holidays. Here are some guidelines you should follow not only for Thanksgiving but year round. Put your drains on a fat free diet! A steady diet of fat or cooking oils put down drains can solidify in pipes (see here). Pour old oil in a can or soak it up with paper towels then place in garbage. Put your disposal on a low carb, low fat, low fiber diet. Fiber rich or starchy vegetables in the garbage disposal. Chicken and Turkey skins, celery, rhubarb, fruits, potato peels and the like cannot be broken down enough in a disposal. Your disposal should be running as you put food into it. Do not start it full of waste. Having in guest over night? Its a good idea to give the shower a break between uses to allow drain to fully empty. Fifteen minutes should be plenty. Keep items not designed to break down in sewer a septic out of the toilet. This includes cotton balls, cotton swabs, facial scrub pads or especially baby wipes as they are often found stuck in sewer drains. 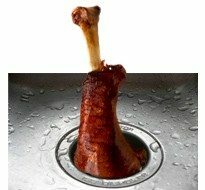 Have a pre-holiday check up for your plumbing to avoid an interruption in your holiday fun with garbage disposal and drain repairs Seattle. If you do run into plumbing problems and you need to get the problem taken or are concerned the problem could lead to further damage then call for emergency service.